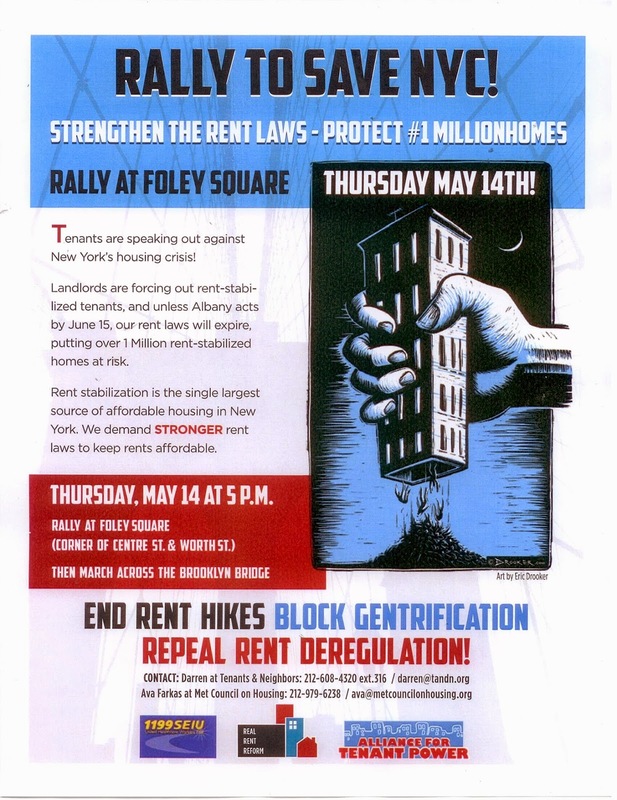 before the RGB Preliminary Vote starts at 6 PM at the CUNY Grad Center @ 365 5th Ave.
Has your legislator signed on to Repeal Vacancy Deregulation? Why do landlords try to get rent regulated tenants out? If an apartment is vacant, it's easier to claim the rent is at least $2500 and permanently take it out of rent stabilization or rent control. To stop harassment and cheap offers to buy tenants out of their apartments, Albany must repeal vacancy deregulation. Urge your legislator to co-sponsor the bill, A.1865-A, that repeals Vacancy Deregulation and re-regulates 98 percent of the apartments that have been lost to Vacancy Deregulation in the last two decades, and to support the repeal of vacancy deregulation and the re-regulation of thousands of apartments. Reinventing the Mitchell-Lama Housing Program: A Second Life for Mitchell-Lama?. Rent-Protection Laws Expire in Two Months: What Comes Next? Excerpt: Tenants’ only hope for not getting screwed this year rests with our friends, the Assembly Democrats. We know the Senate Republicans will look to do the landlords’ bidding, but if the Assembly Democrats do not stand strong, we will lose. The state rent laws will certainly be renewed in some fashion, but the key question is how they might be changed. Current rent laws have led to the deregulation of roughly 400,000 units of affordable housing, through loopholes that allow landlords to deregulate units and to jack up still-regulated rents to force tenants out. A “straight extender” that simply renews the current laws would be a defeat, because these loopholes would continue to eliminate thousands of units of rent-regulated housing every year. 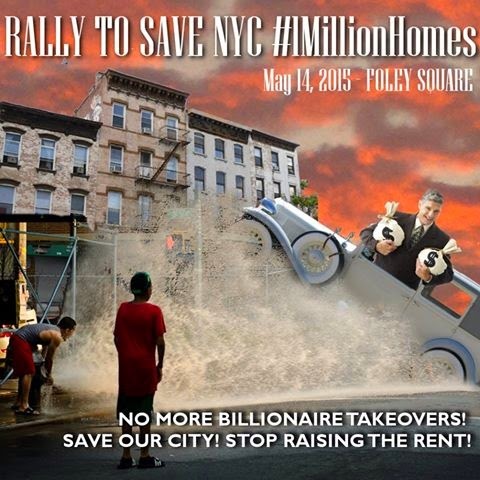 Join the Real Rent Reform Campaign and the Alliance for Tenant Power at the MARCH TO #SAVENYC! 90% of landlords are represented in Housing Court. Only about 10% of tenants are represented in Housing Court. 52% of all evictions in Housing Court are for rent regulated tenants. 100,000 rent regulated apartments have been de-regulated in the past 10 years in Manhattan only! 60,000 people are in our homeless shelters (about 1/3 of the homeless are children) each night in New York City. The largest reason for homelessness is eviction. Paying for a family in a shelter is some $38,000/year. Paying for a lawyer in Housing Court is about $2000. “In cases where the building is destroyed, it does raise an issue as to whether the tenants have the right to return” to a rent-stabilized apartment, said Ronald S. Languedoc, a Manhattan lawyer who represents tenants. Rent-stabilization law does not cover this exact scenario, and the courts have not addressed the matter in much detail. A judge could rule that tenancy rights terminated when the building was destroyed, and the landlord is not obligated to rebuild and provide rent-stabilized tenants with apartments. But if the landlord’s actions played any role in the disaster, a tenant’s case would be stronger. 310 W. 43rd St. between 8th and 9th Ave. in the auditorium. Many of you were a part of the campaign in 2011 when we got some minimal improvements to the rent laws - and you will also remember the massive amount of mobilization it took to get those strengthening amendments. This year we need to band together more than ever, as it is frighteningly clear that if we don't close some of the gaping loopholes in the rent laws in June, we will continue to bleed so much rent regulated housing that we may have nothing left to fight for before very long. The Alliance for Tenant Power (ATP) along with Real Rent Reform campaign (R3) is calling a field meeting for your organizations and ALL organizations affiliated with housing and tenant issues, tenant associations and faith leaders to come together and talk about how best to execute our strategy as well as outline benchmark dates between now and June as we look towards success on June 15th. RSVP to Delsenia Glover, ATP Campaign Manager. Has your Assembly Member co-sponsored the bill to repeal vacancy decontrol and re-regulate market apartments? Section 6 of the bill says that an apartment that has been taken out of rent stabilization or rent control because the rent was too high, will be re-regulated - as long as the rent never reached $5,000. Once back in regulation, the new base rent will be either what the tenant was paying on December 31, 2014, or - if the apartment was vacant, what the last rent was just before that date. If your Assembly Member hasn't signed on as a sponsor, ask him or her to sign on! Those MISSING from the sponsorship list are listed at the bottom of this email. AND ask your neighbors to sign a petition (take the one here and adapt it for your building or group!) and bring them to your Assembly and Senate members and then send the petitions to Governor Cuomo. 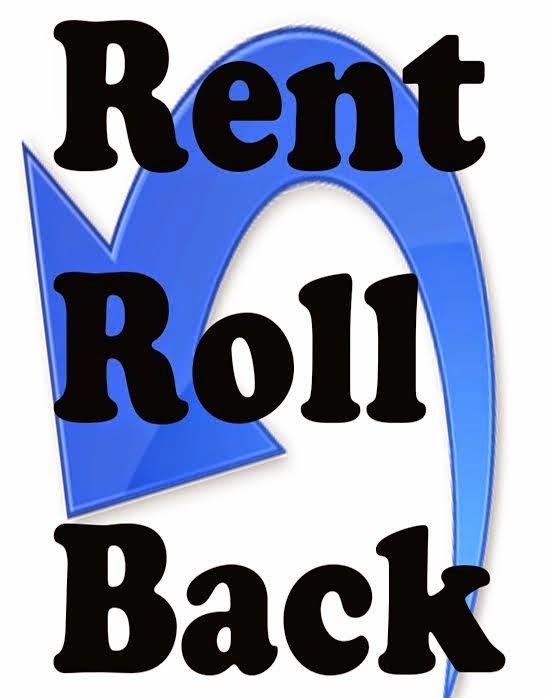 Our rent laws expire on June 15, 2015. At the last Stuyvesant Town/Peter Cooper Village Building Leader meeting in February, we discussed what is at stake. Guest speaker Michael McKee (treasurer, Tenants PAC) explained that if we cannot reduce the phase-out of protections this year it may be too late to do so at the next renewal. The real estate lobby is quite content on a “straight extender” this June because the rent laws as currently written are doing exactly what the real estate lobby scripted.